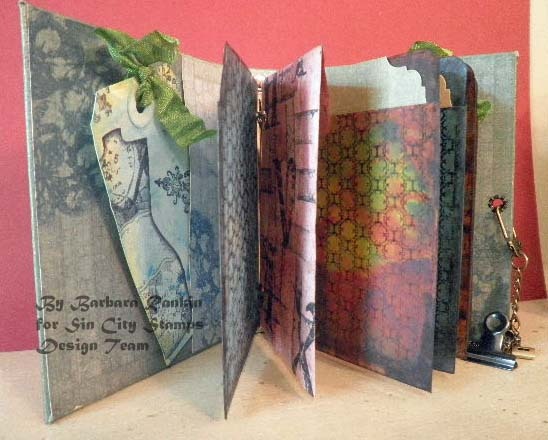 Hello Sin City Stampers, and welcome back to our blog. 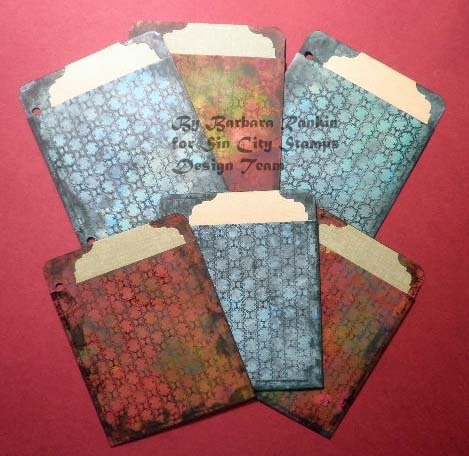 Barbara Rankin here today with Part 2 of my mini album project. 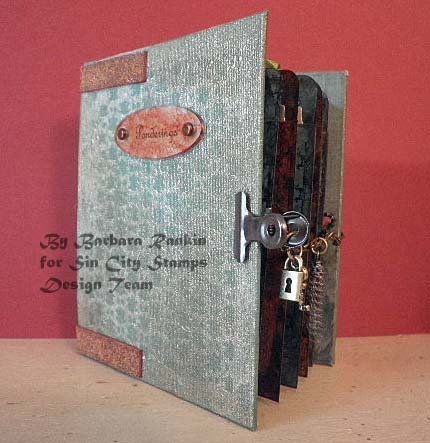 But first, I want to let you know that, in case you have not heard, Sin City Scraps is now Sin City Stamps. In addition to the new name, I hope you will check out the new stamps, stamp plates, and other fabulous products they sell in their online store. You will love what they have to offer. Just a reminder, too, to mark your calendars for a fun Clowning Around With Sin City Stamps Blog Hop on 8 June. If you love the Circus, you will love this hop. If you love inspiration, you will love this hop. If you love giveaways, you will really love this hop. 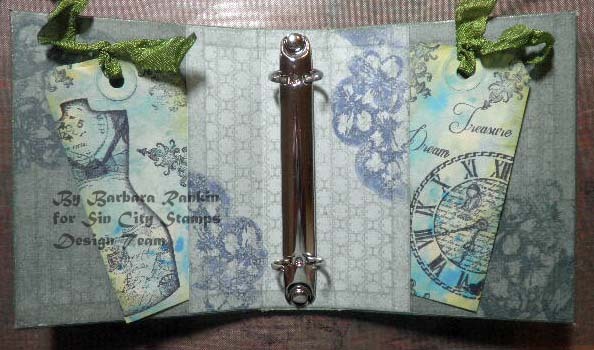 Each blog will be giving away a stamp set of your choice to one lucky, randomly chosen winner. So be sure to come back for this special event. 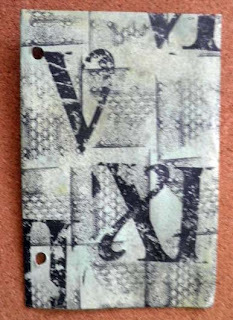 My project today is the second part of my mixed media mini album (shown below), which was posted here on 2 May. If you missed it, you can click here to see Part 1. I promised I would show you some of the things I planned to embellish the inside pockets and tags. 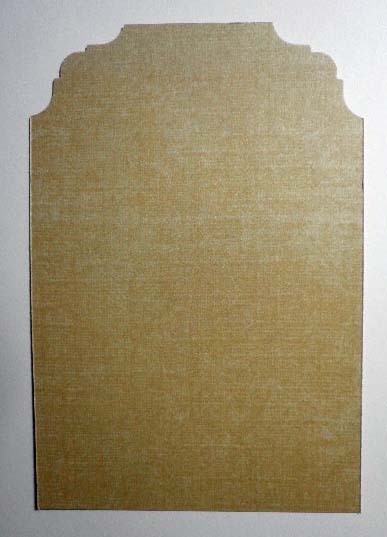 In the picture below, the pockets, tags and envelopes are plain and unadorned. Looks much better, right? And so much fun to make. First, let's work on the tags inside the front and back cover pockets. I just acquired some of the new Distress Paints, so I wanted to give them a try. 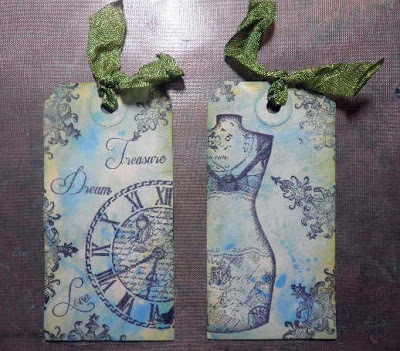 I used bundled sage and broken china to marbleize my two manila tags located inside the front and back covers. 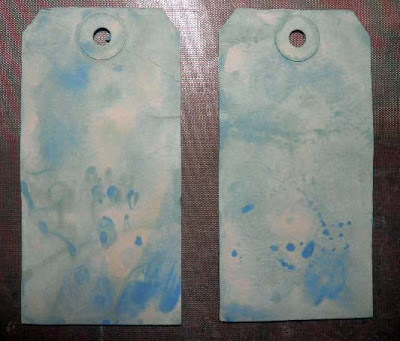 Simply swipe the dabber across the tag, then make two puddles on your craft sheet, spritz both the tag and puddles with water, and let the colors run. 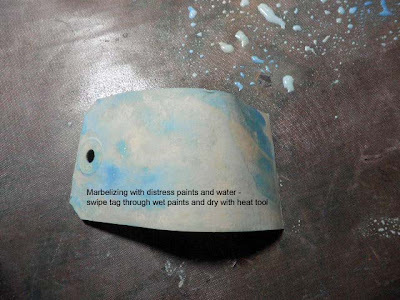 Swipe the wet tag through the puddles to marbleize even more. Next, stamp images from Mannequin Tags 2, Clocks and Birds, and Metal Madness plates, using black archival ink. 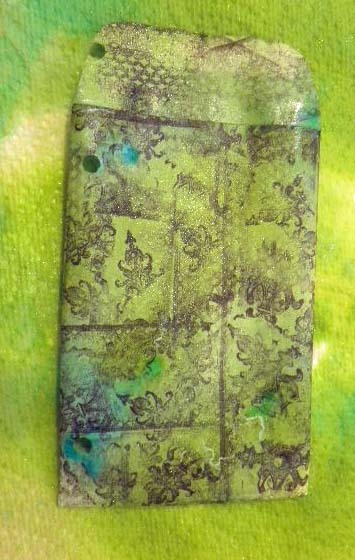 I sponged a little wild honey distress ink around the edges. 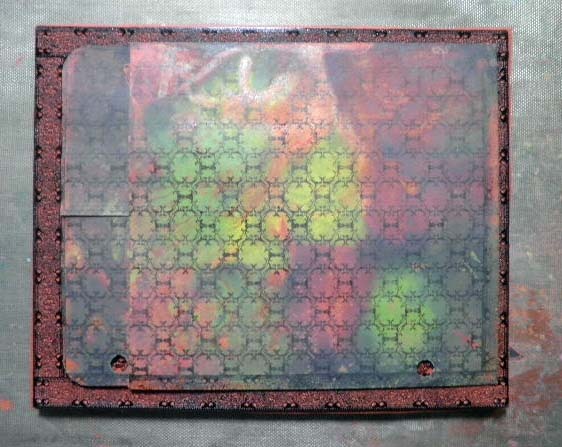 It gave it a bit of a greenish effect, which I liked very much. 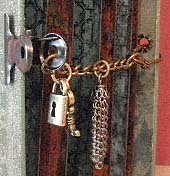 I tied some green leaf rumple ribbon through the holes. 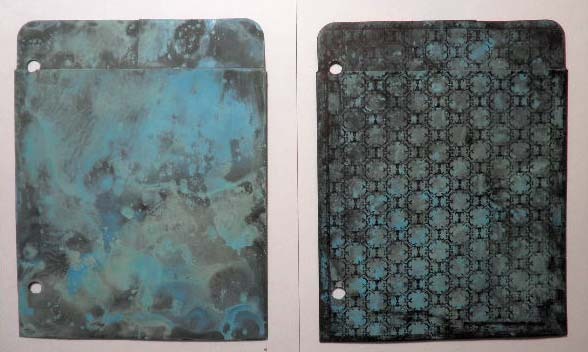 Similar techniques were used on three black library pockets, i.e., puddle bundled sage and broken china distress paints on craft sheet, spritz with water, swipe pockets through wet paint to marbleize them. 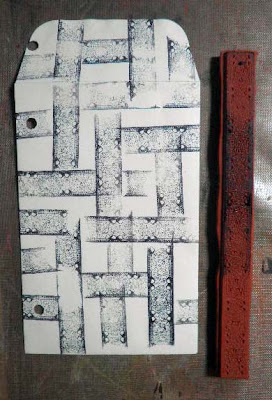 I colored three more black library pockets with a color combo of mustard seed, peeled paint, and fired brick distress paints. 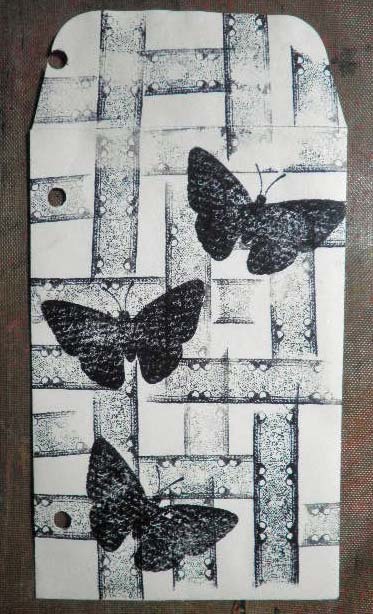 Stamp background image from Metal Madness onto library pockets with black archival ink. Edge with black soot distress ink. Now wait for it. Magic is about to happen. At first glance, what appeared to be a painted, splotchy mess is now a fabulous background. That is the magic of stamps! My tip for stamping a larger stamp onto a smaller piece of paper is to lay your stamp flat on your desk, ink it up, and lay your paper face down on top of the stamp. Burnish with your fingers, a brayer, or a bone folder. Use whatever works for you. I cut six tag shapes 3" x 4" to fit inside the library pockets, then trimmed the top corners with corner edger scissors. 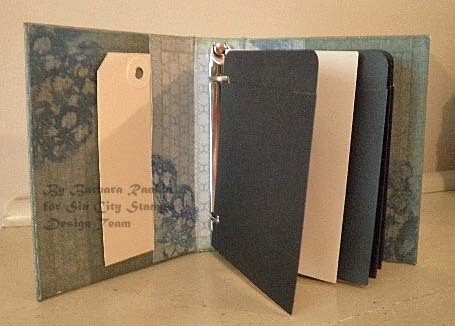 I left them blank so I can add bits and pieces of ephemera, quotations, and anything else I want to put on them. Finally, let's work on the ivory coin envelopes. I am going to use a technique that I am going to call "fragment stamping", because I am only going to use portions (or fragments) of my stamps to make an amazing background. Now, this is fun! 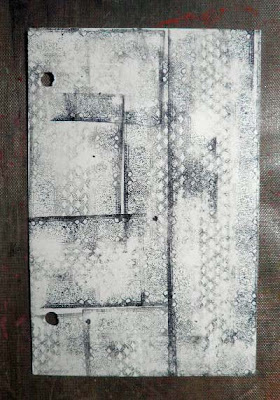 I admit I had to overcome some of my inhibitions, but the key to this kind of stamping is imperfection. What? Are you kidding? 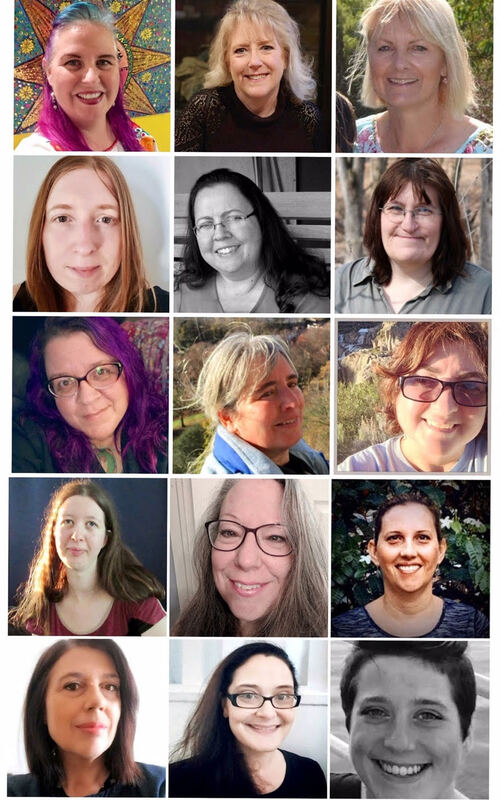 Imperfection from a perfectionist? Yep, and I have got to admit, I had a blast. 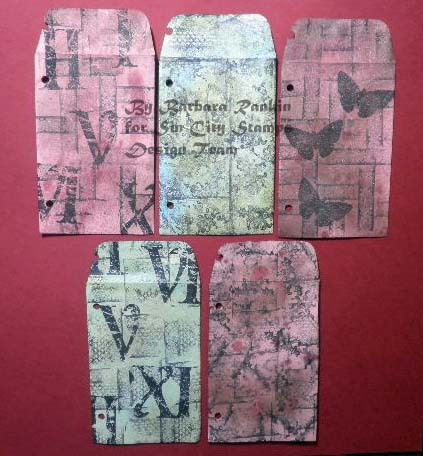 On the five individual coin envelopes, I stamped portions of images from the Metal Madness, Clockworks Inspired by Terri Sproul, and Love of Butterflies, to make these fun backgrounds. 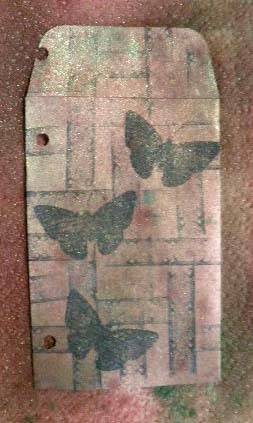 I used black archival ink so my stamping would not run for the next step. 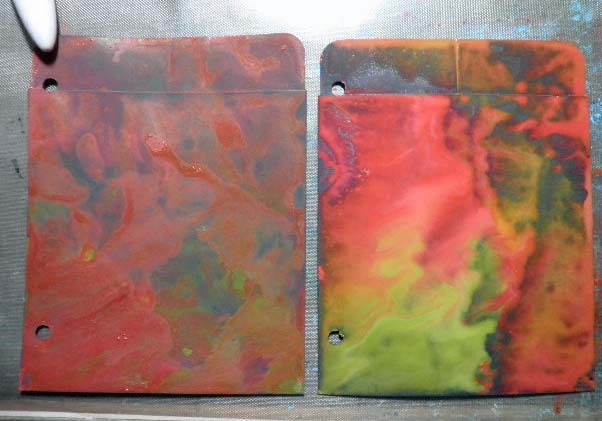 I heat set the ink with my heat gun. Then I used two color combos of Tattered Angels Glimmer Mists, for each coin envelope. 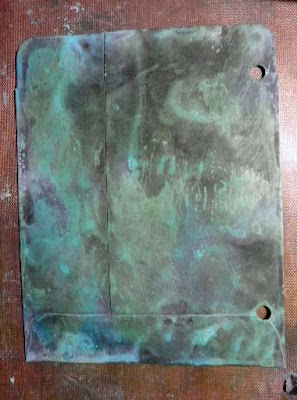 One color combo is Patina, Key Lime, English Ivy. The second color combo is Vintage Pink, Indian Corn, and Chocolate Covered Cherries. Allow to dry. This is my third design using the Clockworks Inspired by Terri Sproul set. 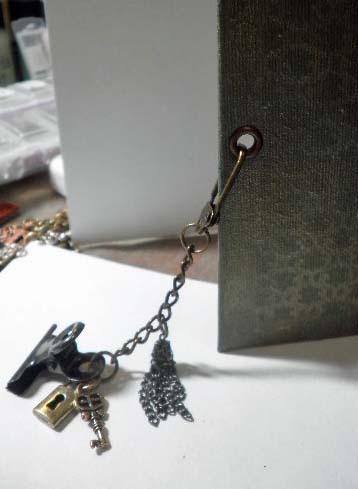 I made this cute binder closure, inspired by Marion Smith, using some Tim Holtz Idea-ology bits and pieces, and some tiny lock and key charms. 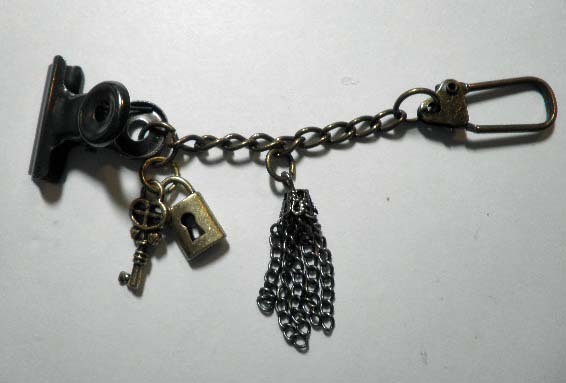 I attached the swivel clasp end to the back cover after inserting an eyelet with my crop-a-dile. 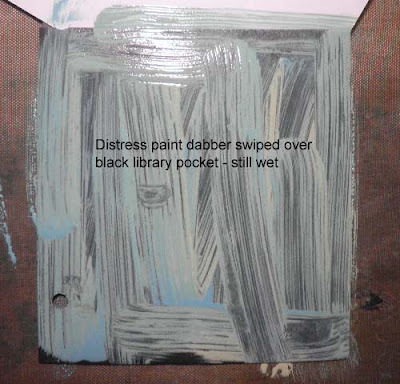 Library pocket pages (were black). 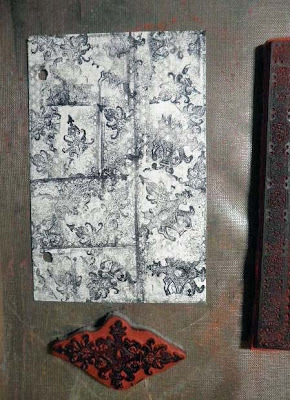 Close up of book closure. My plan for this little mini book is to keep tiny keepsakes and memorabilia, favorite quotations, as well as any profound thoughts I might want to remember. What will you keep in yours? I hope you enjoyed Part 2 of my project today, and that I have inspired you to play with your stamps and mixed media in many different ways. 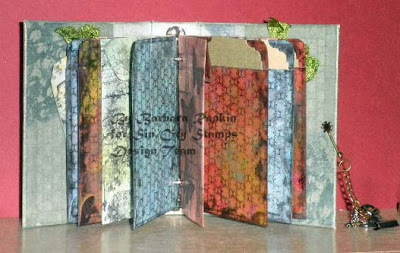 So be sure to stop by Sin City Stamps and check out their new stamp plates, as well as visiting the blog for tons of inspiration from the design team. And don't forget the Clowning Around blog hop coming here on 8 June. It is sure to be as much fun as a three-ring circus! 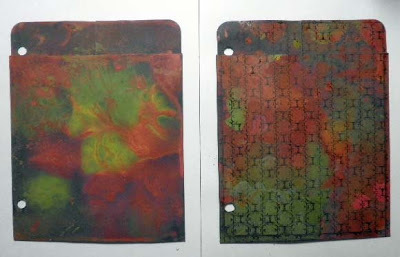 Thanks so much for stopping by, and have a wonderful weekend filled with stamping fun!